Well, this is exciting news for anyone who supports the arts! 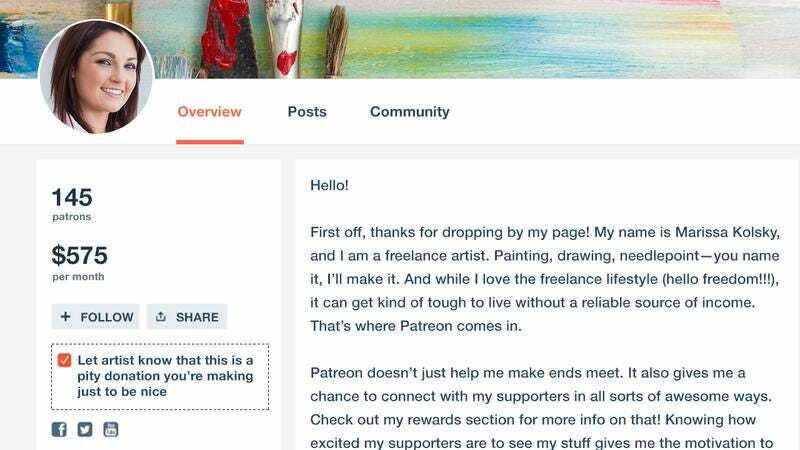 Patreon, a crowdsourcing platform for creatives, just gave itself a major upgrade: The company just unveiled a new feature that allows you to quietly inform someone that you were only supporting their art to be nice! What a tactful, gentle way to support emerging artists that you pity! For anyone interested in using the new Patreon feature, all you have to do is check a box below your donation, click submit, and artists will receive a notification that your financial support was just a matter of you wanting to help a buddy out, not any particular interest in their podcast or webcomic. According to beta testers, the feature is perfect for anyone who wants to support the artistic endeavors of a coworker or former classmate, but also wants to be clear that their donation was out of social obligation, rather than about their art. Wow, good on Patreon for supporting emerging artists without implying they should actually do this for a living. We can’t wait to halfheartedly throw a few bucks to someone with this cool new feature!